Olentangy Liberty’s Grace Clark (3) and Abby Erickson (24) jump to try and block a shot off the hand of Olentangy’s Olivia Margolies during Tuesday’s key OCC clash in Powell. No sport has momentum swings quiet like the ones you’ll see in volleyball. Evidence: Olentangy Liberty and Olentangy’s five-set thriller Tuesday night in Powell. Liberty used a 6-1 run in the fourth set to even things up before starting the fifth set 7-0 to close out a 25-20, 22-25, 11-25, 25-21, 15-9 win over Olentangy to stay unbeaten. The two teams were raising money for Taylor Karlo’s Walk for PKD fundraiser. She was diagnosed over the summer and will participate in the event Oct. 20. So, it was fitting that Karlo provided the game’s first swing, serving up three aces in a 5-1 rally that gave the Patriots control in the first set. Karlo finished with eight kills and three aces for the Patriots (14-0, 5-0). Grace Clark had 16 kills, Claranne Fechter added 10 and Abby Erickson chipped in with nine. Logan Flaugh had 55 assists and four aces, Fechter had 26 digs and Steckelberg added 21 digs to lead Liberty. Olentangy used a 6-0 run to close out the second set, led by Emily Margolies with a couple of kills and a combo block. The momentum carried over into the third, when Olentangy started 6-1 and separated with a 6-0 run in the middle of the set. Olivia Margolies had three kills to lead the way in the second rally. 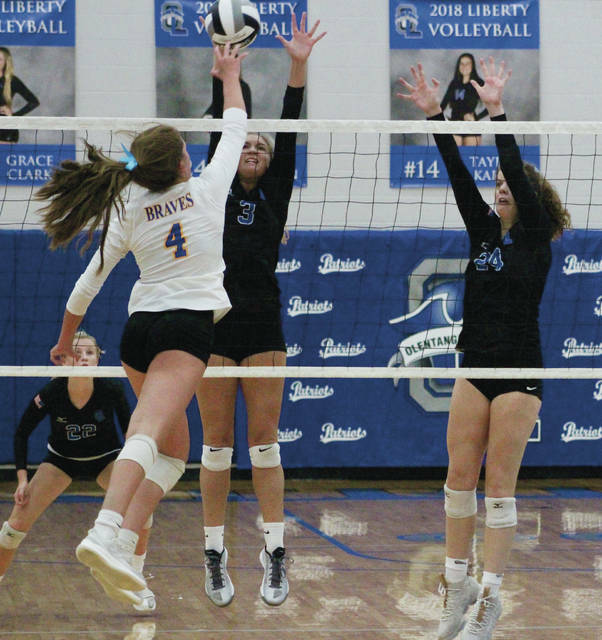 Brennah Gallagher had a pair of aces, including one that closed out the set and Emily Margolies had a kill and a block as Olentangy clinched the third with another 6-0 rally. Clark had five kills and Karlo added four and assisted on a couple of blocks to lead the way in the fourth set to help turn the momentum back to Liberty. That momentum carried into the fifth thanks to Erickson and Flaugh. Erickson had a couple of kills and helped out on a pair of blocks and Flaugh had a pair of aces during a 7-0 start. Steckelberg said changing momentum back was as simple as cheering for each other. Olentangy reeled off six of the next seven points, which started on a Maggie Samijlenko tip shot. But, Raegan Rosi had a couple of kills to help Liberty clinch the win. Emily Margolies provided a well-rounded effort for Olentangy with 18 kills, 21 digs and nine assists. Olivia Margolies had 27 kills, Madyson Chitty had 27 digs, Samijlenko had 40 assists and Abby O’Donnell had three solo blocks to lead Olentangy (14-3, 3-2). Next up, both teams continue league play Thursday night. Liberty travels to rival Orange and Olentangy visits Westerville South.